Adamas pharmaceutical had its initial public offering last year April 10th, the closing of its IPO of 3 million shares at a public offering price of $16.00 per share. The shares began trading on The NASDAQ Global Market under the ticker symbol “ADMS” on April 10, 2014. Adamas had net proceeds from the offering around $41.5 million after deducting underwriting discounts and commissions and estimated offering expenses. Since Dec 24th, 2014 the Namzaric’s FDA approval for the treatment of moderate to severe dementia of the Alzheimer’s type, ans has received a $30 million milestone payment from its partner Actavis. 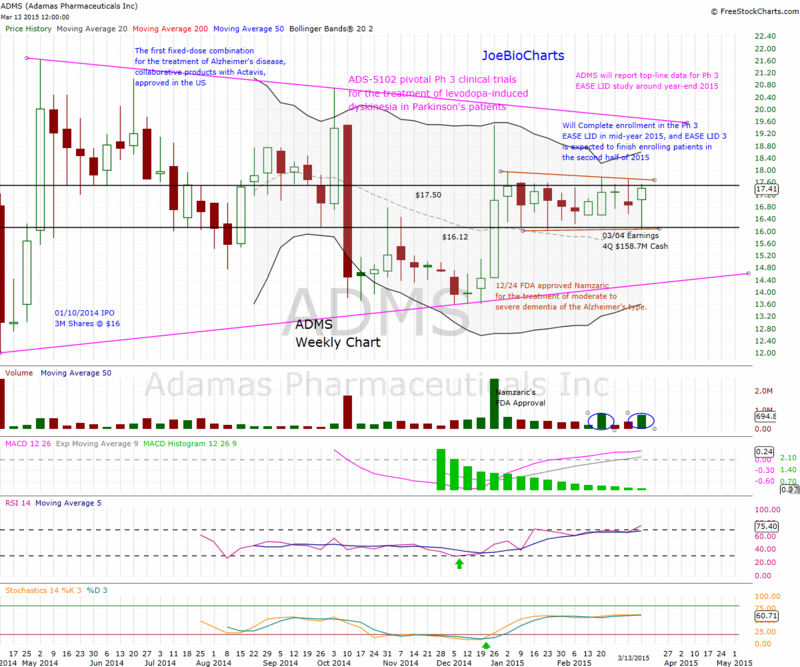 ADMS start trading within a predefined horizontal channel, between the support lines $16.12 to the upper resistance line $17.50, while the Bollinger Bands are getting tighter and closer to each other. This creates a Volatility Squeeze condition within the bands, combined with decreasing volume showing a consolidation mode. This side-way movement can last potentially for a few days or weeks, usually followed by a volatile move and breakout of the upper or lower Bollinger Band, creating a fast and long move. Last Friday we noticed a very large volume of 521K shares compared to a daily average volume of 87K shares, with a one minutes strange price action where 363K shares changed hands between $17.23 to $17.29. 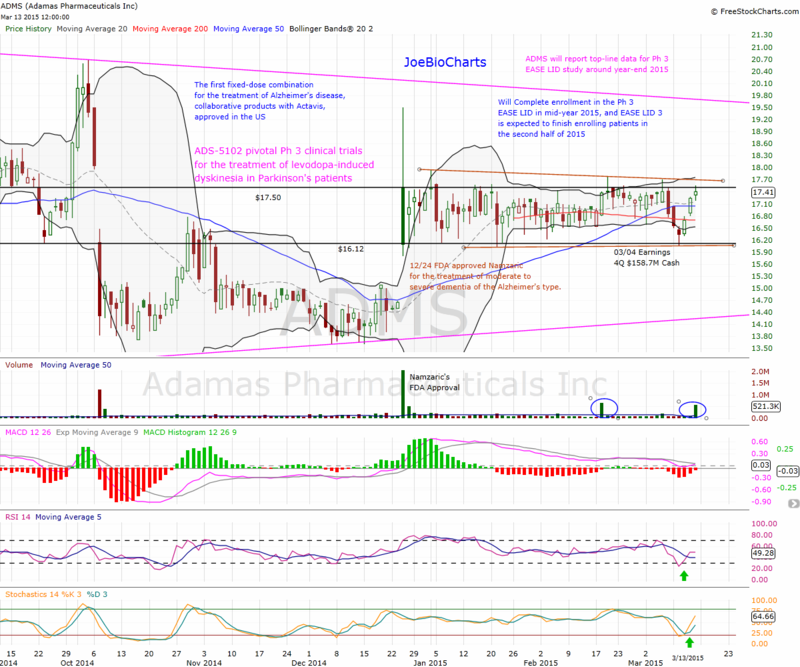 ADMS is an under the radar company with Alzheimer’s asset and trading only 2X of its cash, would be a good time to start a position as we get closer to the volatility squeeze action, the price have to breakout the channel’s upper line $17.50 on large volume and close above the line, that would trigger the upper Bollinger Band to start opening upward as well and bring a volatile price action. Traders can wait for the $17.50 line breakout to start a position with a stop loss bellow the previous trading day, while the risk lover traders can start a position within the channel with a stop loss just few points below the channel’s lower line $16.12.